Fabulously appointed 2 bedroom 2 bath new apartment on the edge of the famous shopping district and great restaurants. Hardwood floors, new kitchen, washer/dryer, flat panel televisions, second floor master bedroom suite. Walk to shopping, Starbucks, restaurants or a quick drive to yacht club. Enjoy a bbq or great book on private patio. Surrounded by beautiful garden...pick your own blueberries and strawberries. Kitchen is fully applianced offering seating at island for 4. High speed wireless connection onsite. The house was perfect and very well kept. 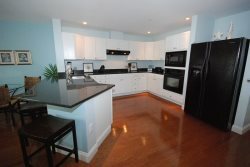 It was in a great location within walking distance to the shops and restaurants of Freeport.